On August 6, 2010, I posted my first recipe, Deviled Tuna Casserole, and A Well-Seasoned Life began. Writing this blog has been one of the most creatively fulfilling experiences in my life. Every day is a milestone! And, I've found myself accepted in a community of wonderful bloggers who inspire me and encourage me to become better in every way. I've also been fortunate in that I've been able to incorporate one of my other passions in life into the blog - my collection of Gooseberry Patch cookbooks. To have been chosen to be part of Gooseberry Patch's Featured Friday not long after I started my blog was more than a dream come true - it was a miracle! I am so grateful to have expanded my relationship with them and to be part of their Early Bird Reviewers. So, I want to send them a very special thank you for, basically, just existing and making my world a better place! As a token of celebration and appreciation, I am giving away a set of Gooseberry Patch cookbooks. These two cookbooks, Flavors of Fall and Taste of Autumn, were the first two cookbooks that I ever purchased from Gooseberry Patch. I was drawn to them because fall is my favorite season and I couldn't believe that there were cookbooks dedicated to it. I had to have them! It started a bit of an obsession, one that has filled my small kitchen and dining room with almost every Gooseberry Patch cookbook that's ever been published. Deadline is August 28, 2011. Good luck and thanks for making this such a great year!! Congrats on your 1-year blogiversary! Happy 1 year blogiversary :)) I just celebrated mine 5 days ago! Funny enough, one of my first posts (5 Aug) was tuna casserole! @Sarah - What a coincidence! How funny! Congratulations on your Blogiversary!!! I am a follower and would love to have you add me to your giveaway!! Happy Anniversary fellow blogger :) Pls count me in for this giveaway (superb books!) and of course I am a follower. To say I would LOVE a copy of these cookbooks is an understatement!!!! I am a stalker of yours and Gooseberry Cook Books! ;) And I have these both...they are my favorite, because Fall is my favorite Season of all! Congrats for a Blogiversary, with your "partnership" with Gooseberry Patch! Congrats on one year! I would love to win those cookbooks. Happy Blogiversary! I love your blog and have been following for a while. I also love Gooseberry Patch cookbooks, although I only have a few. I would love these two. Fall is my favorite season! Congrats on your 1 year blogiversary! I am a follower and would love to win! Congratulations!! I am a follower of your blog and would love a chance to enter for the wonderful cookbooks! I love collecting cookbooks but I don't have ANY Gooseberry Patch cookbooks so I would be delighted to win your fabulous prize! I already follow your blog so thank you for including me in the giveaway! Happy blog anniversary!!! I am a follower and would love to have you add me to your giveaway. I love Gooseberry Patch cookbooks. Thank you for being an enabler. :) I would love to win the cookbooks. Happy Birthday!!! my email address is knightgang@comcast.net. Congratulations on your one-year anniversary! May your success continue! Gooseberry Patch cookbooks are one of my weaknesses, as well. I'm sure I have room for two more in the event that I might win. I would love these cookbooks!! Congrats as well. I am sooooooooo looking forward to fall! Congratulations! I love fall too and all the fall spiced recipes! I just found your blog today. Love it! Gooseberry Patch cookbooks are an addiction of mine too but I don't have either one of these. My email is angelmeek1@yahoo.com. Oh, I absolutely LOVE Goseberry Patch and would LOVE to win these two boks!!! I have ben collecting everything GBP since their beginning. I have to confess I have Flavors of Fall already, but my mother-in-law would love it when I give it to her. I have enjoyed your blog since I found you and became a follower. I'm a new follower on Google Friends ! I love Gooseberry Patch stuff! Contrats on your 1 yr Anniv! Enjoy following your blog. This is a great job you are doing. It benefits so many people. I am fairly "green" at this blogging, but would love to be a winner of the cookbooks and become more and more proficient at cooking and blogging. I just love Gooseberry Patch recipes (and my husband does too)! Good luck to me (and to everyone else as well). Have a wonderful week. Oh, my e-mail is pradde@centurytel.net (Thank you). VERY interested in this giveaway. Fall is my favorite season and time of year as well. 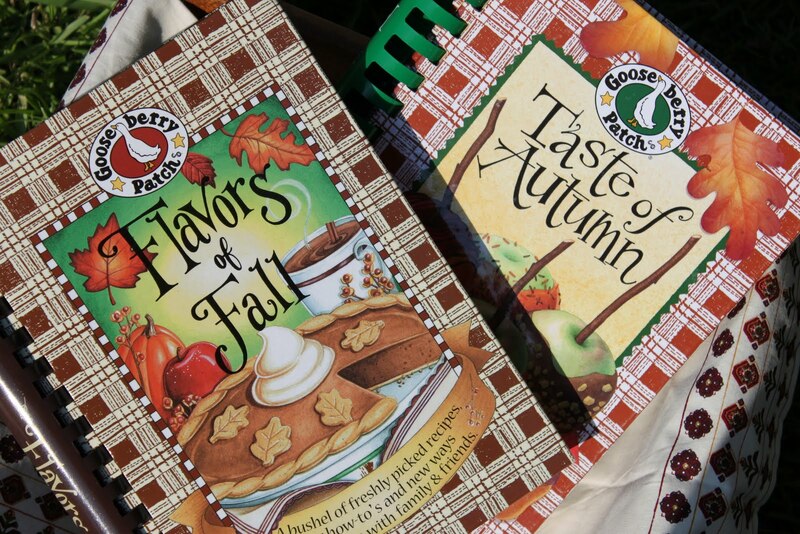 And who doesn't love them some Goose Berry Patch cookbooks?? Congrats on your 1st blogaversary. May you have many more. 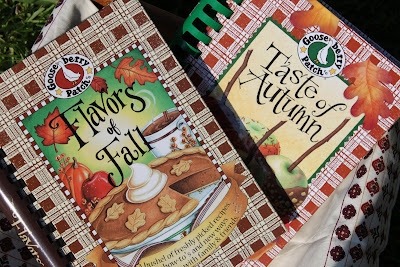 Love Gooseberry cookbooks and a chance to win two celebrating fall after the hot summer we have had sounds delightful! Thank you for the give away. Congrats on your one year! I just bought my first Gooseberry Patch cookbook about a month ago and I am addicted! Consider me a new follower for your blog! Count me in as being interested in winning those fabulous books! Congratulations and best wishes for continued success on the event of your one year "blog-versary". The two fall cookbooks fill me with excitement and wonder about all of the new comfort foods I will be able to prepare when the snow is knee-high or higher..and the wind is whistling around the corners of the house! I will keep my fingers and toes crossed! Congrats on your one year! I just recently bought my first Gooseberry Patch cookbook and I am addicted! Consider me a new follower! I hope I win those cookbooks! If I do, I might not leave the kitchen! I am so glad I came upon your blog! And thank you so much for your offering this giveaway. I love Gooseberry Patch! My e-mail is my-creative-inspiration@comcast.net . Happy blogiversary! I have become a follower and I'm excited about finding your blog. I'm also very interested in the giveaway. I LOVE Gooseberry! Thanks! Congratulations on your blog anniversary! I am now a follower and would love to expand my cookbook collection! Congrats! I am loving your site and I am looking forward to exploring your recipes. I love Gooseberry and I love simple delicious recipes. Congratulations on your one-year anniversary! Thanks for all you share!! Would love copies of these cookbooks!!! I too am a Gooseberry Patch addict and I am not one bit ashamed to admit it! Would love love LOVE to win the cookbooks. Congrats on your blogs one year anniversary! I just love gooseberry patch cookbooks, but sadly have none of my own. My favorite time of year is fall. My tummy fills with excitment this time of year when the leaves all change beautiful colors, when there is a cripsness in the air and when you can fill your tummy with the warm goodness of some good ol cheesy potato corn chowder, fresh baked biscuites and some hot mulled cider. mmmmmmmmmmmm. I am so ecited I can't wait!! I too am a follower! Thanks for entering me in your drawing! Congratulations! I love fall cookbooks, too. I'm pretty much sold if there is pumpkin in the ingredient list. Thanks for the great contest! Congratulations on your anniversary... You are doing a great job for only a year! Thank you for giving away Gooseberry Patch Fall cookbooks..Please enter me in.. I Loooooooove all things fall as well. Now that I live in SC it definately isn't done like it was in the North...Oh well, making the best of it. Thanks for the invitation to blog. Congratulations on your successful first year, and wishing you many more! Fall is my favorite season, and Fall foods seem to be the ones we most enjoy, as well. And I LOVE Gooseberry Patch cookbooks! I would very much love to have the cookbook collection, and would share with my niece, who also loves cooking and cookbooks. Thank you! I don't have a blog, Google account, etc. Only have access to the Internet at work. Congratulations on your one yesr milestone. Will become a follower. I would love you to come and enter my give away too. A beautifully handcrafted Danish porcelain house number. Oh I don't have these ones!!! I love the flavors of Fall. Happy Blogaversary. I love Gooseberry Patch Cookbooks and FAll. In fact, it's my favorite season after Spring. ooI'm a "follower" and would be so thilled to win not one but two books. Congrats on one year! I would love to win. Congrats to you. Throw my name in the hat. Always great recipes in GPCs. Love Gooseberry cookbooks, this one looks awesome!! Fellow cookbook reader! would love to read these, love the gooseberry! in fact lived on a street in greenwood,In named "gooseberry"
I just adore fall as well and would love a chance at these cookbooks. Thanks so much and blessings to you! I would love to win a Gooseberry cookbook. I love to read all the great bits of information and to try recipes. Thanks again for this opportunity. I to am addicted to these books. My family loves everything I have made out of them. I would so love to win this give away. I Love Fall. I love Cooking And Would love to have these's cook Books on My counter reading the wonderful Gooseberry recipes that I know flow threw the books. This site is also beautiful Thanks for the Share.My son Just joined the US Marines . I would love to win theses to Share all the goodies in the care packages I know I'm going to be sending .. Thank you..
Congratulations on one year! It's always good to step back and have a look at what you've accomplished.